Ervin Santana threw a complete game victory, striking out 9 Padres and allowing just 4 hits and 2 runs and drove in a pair himself with a hit as the Twins got a much needed 5-2 win. Vance Worley held the Nationals scoreless for 7 innings, giving up 2 hits to earn the 7-0 decision for the Marlins. Elvis Andrus got 3 hits, including a homer, in the Rangers 5-1 victory over Seattle. Yadier Molina homered twice and added another hit as the Cardinals edged the Brewers, 5-4. Happy 4th of July everyone! It’s Tuesday which normally means it’s a huge slate of baseball but since it’s the holiday we have a split slate to contend with. We’ve got some great pitching options and some even better bats to look at today. In this article, I will be providing you with my daily fantasy baseball lineup picks for FanDuel and DraftKings on 7/4/2017. The DFS lineup picks will range from some of the elite players to mid-priced options, and of course, value plays. Jordan Montgomery threw 7 strong innings, allowing 1 run and struck out 8 White Sox batters to earn the 6-5 decision for the Yankees. Lonnie Chisenhall went 3 for 5 and drove in 3, including the tying and go ahead runs, as the Indians made a remarkable comeback, 15-9, over Texas. Michael Wacha give up 5 hits and 1 Reds run over 6 innings to win the 8-2 final for St. Louis. Jedd Gyorko homered, got another hit and a walk, drove in 3 as the Cardinals topped the Reds, 8-2. Edinson Volquez threw the first no hitter of 2017, going the distance against Arizona, striking out 10 and walking 2 for the 3-0 Miami win. David Price gave the Red Sox a much needed strong start, going 7 innings, allowing 1 run and 3 hits while striking out 7 Orioles en route to the 5-2 decision. Chris Taylor reached base 4 times, stole a pair of bases and hit a dramatic come from behind grand slam in the 9th to give the Dodgers another comeback victory in Milwaukee, 10-8. Ryon Healy doubled twice and homered twice to lead the A’s in a 10-4 rout of the Nationals. Robbie Ray threw a complete game 4 hit shutout, striking out 10 Pirates for the 3-0 Arizona win. Austin Hedges hit a 2 run homer and a 2 run double to propel the Padres past the Cubs, 6-2. Eric Skoglund threw 6 1/3 innings of 2 hit, shutout ball, whiffing 5 Tigers, in his big league debut and earned the 1-0 decision for the Royals. Elvis Andrus singled, doubled and homered, driving in 5 runs and scoring a pair as the Rangers outlasted Tampa Bay, 9-5. The Texas Rangers won an American League best 95 games last season – to win their 2nd AL west Division. and to make the playoffs for the 5th time since 2010. The winter has not gotten off to a good start, as they have watched the Astros and Mariners all add depth to their teams – while Texas has lost players from their own year end roster. The team has to get involved right now to change the course of this offseason. The time to win is now with Yu Darvish and Jonathon Lucroy in walk contract years – while their ALL – Star Veterans like Cole Hamels and Adrian Beltre become another year older. The Rangers have been one of the better teams in the MLB since the 2010 season. Back to Back AL Pennants, and now back to back AL West Division wins have seen them reach the playoff 5 times out of the last 7 campaigns. For those who like pitching – the franchise has 2 number one aces for at least one more year in Yu Darvish and Cole Hamels. Simply put, the development of all of their Draft Picks, domestically or international, coupled with the management’s keen eye for talent, have the club still in the conversation for another few years. Houston has signed Free Agents Josh Reddick and Carlos Beltran – with also dealing for Brian McCann. This will not affect their 2017 squad as both didn’t require anybody from the Major League Roster to get it done. The Toronto Blue Jays have had to contend with the overspending in the last 25 years by the Yankees and Red Sox. With stiffer penalties now imposed on the higher payroll clubs. coupled with their recent back to back ALCS Appearances, the franchise draws enough to spend more money on total team salary in the next few years. It will come down to the management’s ability on player personnel that should determine their success for the next 5 years and not sheer finances. Tomorrow we will point out the clubs that were hurt most in the short term. today we talk about the winners of the new deal. I am calling the Nationals, Mariners, Astros, Jays, Cardinals and Giants the immediate victors under the new format. When i was thinking about more the past two days, the new structure seems to favor mid level payroll teams more than the lower or higher payroll clubs. With the new penalties for spending way more money than the Luxury Tax Threshold, the Yankees, Dodgers, Red Sox and Tigers are going to find that the impact will run pretty steep on their roster decisions for the next 5 years. Have you noticed that Marco Estrada is putting together a terrific October resume? I thought Cole Hamels was going to be a playoff hero. Nope. Turns out a new hero is emerging. And suddenly my pick to win the World Series could be on their heels. Meanwhile Jason Kipnis wants to be beloved in Cleveland and Terry Francona showed how a bullpen is handed. Josh Donaldson reached based 5 times, doubling twice, driving in 2 and scoring twice and sparked the Blue Jays to a 10-1 blow out in Texas. Marco Estrada pitched a shutout into the 9th, finishing with 1 run over 8 1/3 innings, 4 hits and no walks, as the Blue Jays cruised to a 10-1 beating of the Rangers. Jason Kipnis collected 3 hits, including a homer, driving in 2, to lead the Indians past the Red Sox, 5-4. Andrew Miller came out of the bullpen in the 5th innings and struck out 4 Red Sox in 2 shutout innings, earning the 5-4 decision for Cleveland. Elvis Andrus got a pair of hit, including a tripled, and scored the Rangers only run in Toronto’s 10-1 drubbing. Andrew Benintendi homered and singled in the Red Sox 5-4 loss to Cleveland. Marco Estrada took a no hitter into the 7th and finished with 7 innings of 1 hit, 8 strikeout ball, giving Toronto a critical 3-2 victory in Seattle. Clayton Kershaw threw 7 innings, allowing no earned runs, striking out 7 Giants and allowing only 3 hits. He did not get the decision but helped set up the Dodgers 2-1 come from behind walk off win. Freddie Freeman went 4 for 5 with a homer and 3 RBI to lead Atlanta past the Mets, 7-3. Elvis Andrus got 3 hits, including a homer as the Rangers edged the Angels, 3-2. They all owned baseball on September 19, 2016. P- Tyler Anderson (Philadelphia Phillies): $9,500. Anderson is coming off a very strong start, which he gave up one run, on two hits, and five strikeouts over seven innings pitched against Rangers. Over his last three starts, he has given up a total of four runs (1.80 ERA) with 16 strikeouts in 20 innings pitched. Philadelphia has the worst OPS and OBP against left-handed pitching this season, which is clearly favorable for Anderson. P- Zach Davies (v. Cincinnati Reds): $7,600. Davies has faced Cincinnati twice this season, which has has done quite well in those starts. In 12.2 innings, he has given up only two earned runs to the Reds. Over his last three starts, he has a 2-0 record, 3.32 ERA, and 12 strikeouts in 19 innings pitched. P- Aaron Sanchez (vs. Kansas City Royals): $10,800. Over the last seven games, Kansas City has struggled at the plate. They have a .202 batting average, .251 OBP, and a .300 slugging percentage. Sanchez has been dominant all year long and it shouldn’t be any different on Saturday as he faces this mediocre Royals’ offense. P- Jose Berrios (vs. Tampa Bay Rays): $7,100. Tampa Bay’s offense has been lackluster in 2016. Berrios has struggled in his rookie season, but he continues to rack up the strikeouts. In 2016, the Rays have struck out 971 times, which is ranked 26th in baseball. Berrios has the potential to put up a huge game on Saturday if he can stay ahead in counts and keep the Rays lineup off balanced. P- Masahiro Tanaka (vs. New York Mets): $9,700. In two career starts against the Mets, Tanaka owns a 1-1 record with a 1.20 ERA. The Mets offense has struggled all season long, so hopefully Tanaka can take advantage of their struggling bats. Over the last seven games, the Mets’ offense has a .622 OPS, which is ranked 27th in baseball. P- Gerrit Cole (vs. Atlanta Braves): $9,000. Cole is coming off a beautiful complete game performance. He is also facing one of the worst offenses in baseball, so this should be a favorable matchup. In his last two starts, he has allowed two runs on nine hits and a walk, while striking out 13 batters. P- Cole Hamels (vs. Kansas City Royals): $9,900. Hamels is coming off a successful start against the Royals his last time out. He threw 5.1 innings, giving up only one unearned run. He has won both his starts since the all-star break, giving up only two runs in 13.1 innings pitched. P- Tyler Anderson (vs. New York Mets): $7,700. Anderson is facing an offense who has struggled all season long. Over the last seven days, the Mets are ranked 28th in OPS and 29th in runs scored. Over Anderson’s last eight starts, he has given up no more than three runs in seven of those starts. He has also walked two or fewer batters in those starts, which is great for daily fantasy. P- Jon Lester (vs. Milwaukee Brewers): $10,600. In four career starts against the Brewers, Lester holds a 2.22 ERA with a 2-2 record. Lester has been impressive all year long. He currently owns a 10-4 record, with a 2.89 ERA, and 111 strikeouts in 118.1 innings pitched. Milwaukee ranks in the bottom third in the MLB against left-handed pitching this year, so this favors Lester on Sunday. P- Rick Porcello (vs. Minnesota Twins): $9,200. Porcello has been on fire over his last four starts as he is unbeaten. In his last time out against the Twins, he gave up only one earned run over seven innings pitched. Throughout the last five years, Porcello has dominated every hitter in the Twins’ lineup, so I don’t see anything different happening on Sunday. Due to the amount of time dedicated to the analysis of my midseason top 100 prospect rankings analysis, which you can find on my blog, I will not be providing reasonings behind my DFS picks for the next few days. I can assure you my picks below have been chosen using the same research methods I use on a daily basis. These methods include weather, B v. P stats, recent success, splits, stacks and much more. If you have any questions or comments, I will be glad to answer via social media (@dynasty_digest). 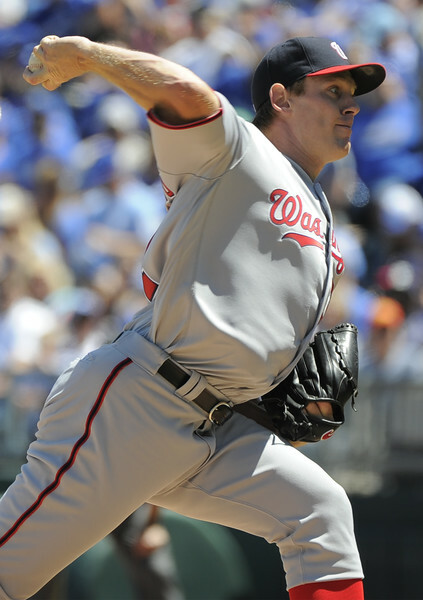 P – Max Scherzer (vs. Milwaukee Brewers): $13,900. In 61 career at bats against Scherzer, the Brewers’ offense is batting .115, with 28 strikeouts, and a .169 OBP. In his last start against Milwaukee, Scherzer held together a perfect game through seven innings. Unfortunately he lost the perfect game in the seventh, but he only gave up one hit with 16 strikeouts in the complete game. In his last three starts, he owns a 2-0 record, 0.90 ERA, and 27 strikeouts. P – Cody Reed (vs. San Diego Padres): $7,200. In his MLB debut, Reed showed lots of promise. He threw seven innings against the Houston Astros, giving up four runs, and striking out nine. His ability to strike batters out should make him a very good play on Friday. San Diego is ranked 27th in strikeouts, which is great for Reed. With Spring Training at full swing now, it is time to see how the players from the Kingdom of the Netherlands will do in the upcoming season. Of course there is no crystal ball and it is still up in the air, but in general you can make a decent prediction based on the performance of previous years. Jurickson Profar is finally on the way back from a very long stint on the DL. Jurickson Profar started the 2014 season on the 60-day DL and was expected to return to the Rangers mid June. But somewhere in May 2014 the Rangers announced that Jurickson had re-injured his shoulder again. He opted for rest instead of surgery. But as Profar becmae injured again in February 2015, it was decided that he would get surgery. This would cost him almost the entire season. In August he started his rehab stint with several MiLB teams of the Rangers and he was added to the Arizona Fall League to get ready in time for the 2016 campaign. In both cases he served as a DH.